Next Sunday’s referendum could force Greece to leave the single currency. Yet bond markets are trading shy of full crisis levels. If things stay that way it eases the pressure on euro zone politicians to offer sweeter terms to the country’s leader, Alexis Tsipras. 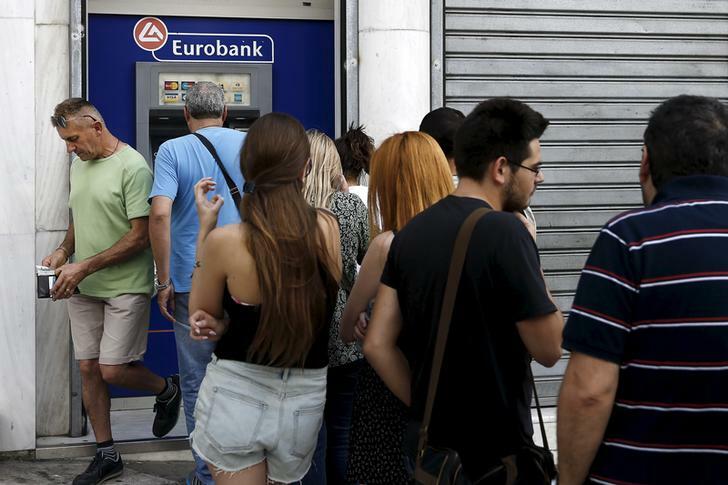 A man puts money in his wallet as people line up to withdraw cash from an ATM outside a Eurobank branch in Athens, Greece June 28, 2015. Bond yields of weaker euro zone states rose after the Greek government said it would hold a referendum on its bailout programme, and impose limits on bank cash withdrawals. The spread Spain pays over Germany to borrow for 10 years rose to 162 basis points in early trading from 118 basis points on June 26, but fell back to 149 basis points by 1200 GMT, according to Tradeweb data, lower than levels in early June. Italian 10-year spreads were at 153 basis points as of 1200 GMT, the highest level since November 2014. This Context News has been updated to correct the “basis” and “percentage” point descriptors used in an earlier version.